Big, burly, not so pretty Ethan Laidlaw fit the prescribed role of “heavy” in westerns as well as anyone…no wonder he worked so steadily in silent and sound westerns (as well as serials and TV shows) for 35 years (1925-1960). Born November 25, 1899, in Butte, MT, the son of Charles P. Laidlaw and Mary Olas, he had one brother, Byron E. Laidlaw. Before entering movies (possibly as early as 1923 in uncredited roles), Ethan Allen Laidlaw worked as a bus driver, mechanic, steam fitter, painter, policeman and salesman. He’d also obtained an engineering degree. With that background, what brought him to Hollywood and movies is unknown, but his 6' 1", 180 lb. frame and menacing looks—a long straight nose protruding over his upper lip which held a thick, trimmed black mustache over a short chin—gave him a hawkish look that automatically branded Laidlaw as a badman. His earliest traceable movie is “Crack O’ Dawn” (‘25), an action drama with Reed Howes. His first credited western was “No Man’s Law” (‘25) with Bob Custer which started him on a path of western villains. 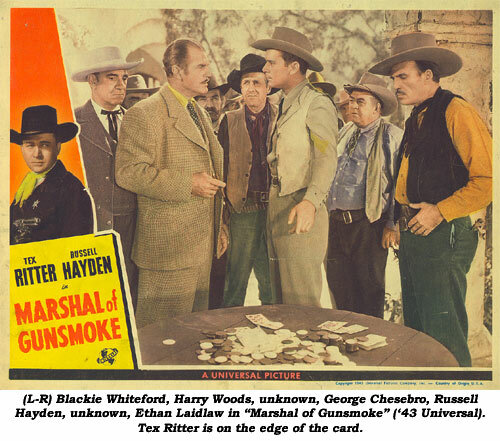 He traded silent gunfire with Tom Tyler, William Russell, Tom Mix, Buzz Barton, Hoot Gibson, Jack Perrin and others. He slid easily into early talkies, appearing in “The Virginian” (‘29) as a posse member and “Pardon My Gun” (‘30) with Tom Keene. 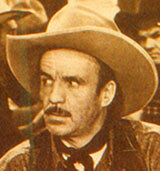 From there, he appeared in over 220 films, of which more than half were westerns, and over 20 serials. Although he worked steadily, he seemed to usually have little dialogue, with his role seldom more than that of a henchman. He’s seen to good advantage in “Cowboys From Texas” (‘39) w/3 Mesquiteers, “Law and Order” (‘40) w/Johnny Mack Brown, “Fugitive From Sonora” (‘43 Republic) w/Don Barry, “Marshal of Gunsmoke” (‘44) w/Tex Ritter, “Western Caravans” (‘39), Six Gun Law” (‘48) and “Trail of the Rustlers” (‘50) all w/Charles Starrett. But he also shot at and fought with Tim McCoy, Buck Jones, Tex Ritter, Richard Dix, George O’Brien, Gene Autry, Cisco Kid, Don Barry, Tim Holt, Kirby Grant, Rod Cameron, Bill Elliott and others. 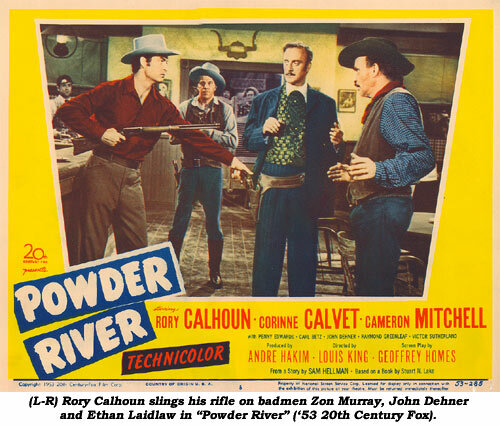 Amidst his B-western and serial work, Laidlaw essayed smaller roles in many A-westerns: “Allegheny Uprising” (‘39) w/John Wayne, “Jesse James” (‘39) w/Tyrone Power, “Union Pacific” (‘39) w/Joel McCrea, “Texas” (‘41) w/William Holden, “Desperadoes” (‘43) w/Randolph Scott, “Relentless” (‘48) w/Robert Young, “Winchester 73” (‘50) w/James Stewart, “Powder River” (‘53) w/Rory Calhoun, “Great Missouri Raid” (‘51) w/Macdonald Carey/Wendell Corey and more. 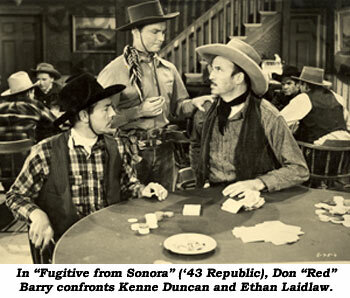 In all, according to researcher Les Adams, 134 westerns and 16 serials. Laidlaw’s threatening countenance was used in comedies also—such as “Goofs and Saddles” (‘37) w/the 3 Stooges, “Sillie Billies” (‘36) w/Wheeler and Woolsey, “Alias Jesse James” (‘59) w/Bob Hope, “Wistful Widow of Wagon Gap” (‘47) w/Abbott and Costello and “Behind the Eight Ball” (‘42) w/the Ritz Brothers. Gangster films such as “Crime School” (‘38), “Invisible Stripes” (‘39) and “The Killers” (‘46) also fit his looks. 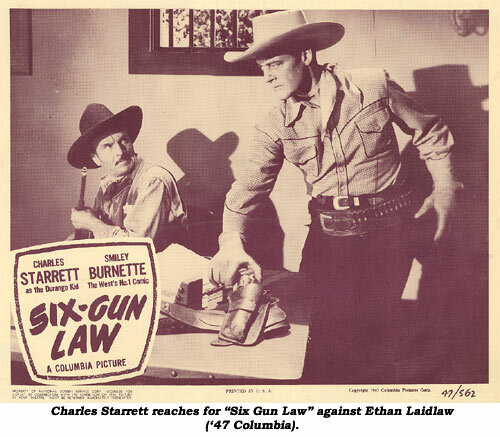 Entering his 60s, Laidlaw’s work on TV was relegated to fewer and lesser roles on “Bat Masterson”, “Wild Bill Hickok”, “Destry” and “Wyatt Earp”. In short, Laidlaw did it all! He was married to Marie V. Laidlaw, a registered nurse, at the time of his death from a heart attack May 25, 1963, at only 63 and was living at 6767 Wedgewood Place in Hollywood. He is buried at Forest Lawn Cemetery. His death certificate credits him with service in WWII. This is suspect. It isn’t often 42 year olds are drafted or enlist. Then too, during the war years (1942-1945) Laidlaw is credited with dozens of films. The death certificate may be in error and it may have been WWI at which time Laidlaw would have been of draft age. But then, Hollywood actors often joined the California National Guard, assuming they would not be called to action, continuing their careers, and getting credit for military service.